Following the acquisition of PacketVideo’s North American and European operations in March, our new entity (privately owned by J.M. Driver LLC) needed to come up with a company name. Thus began an exciting chapter for any new enterprise. We wanted a name that spoke to our key role in enabling media connectivity in the connected home, but also wanted to somehow acknowledge our outstanding employees that came over with the acquisition because we think they are the smartest and most talented engineers in the industry today. We wondered if it would be possible to accomplish both objectives. One thing we knew from the beginning was that we did not want to create a “coined” or made up name for the company. After doing lots of research and brainstorming, we came up with a variety of interesting name possibilities. Soon one name rose to the top of the list: lynx. It was a great nod to the linking capabilities of our Twonky technology (as in, Twonkylinks multiple digital devices in the connected home) and it was perfect because ‘links’ sounds like ‘lynx’ in the spoken English language. The lynx is an amazing wild cat. As noted by the world-famous San Diego Zoo here in our hometown, the lynx has many admirable traits, including “keen vision”. It’s a small but mighty cat with remarkable hunting prowess such that it can hunt much larger prey than one would think given its relatively small size. And while we may not be as large as some of our customers, we consider ourselves to be a mighty hunter in the (connected home) jungle, thanks to our world-class engineering team and our Twonky technology, which has consistently led the industry as the most reliable and proven technology for over 10 years. Another admirable trait of the lynx is its ability to blend into the environment, making it a highly successful hunter. We believe our Twonky technology also shares a similar ability to blend into the environment because it performs so well with our customers’ products and services, making sure that it works flawlessly with other digital media devices in the connected home to delight the consumer. 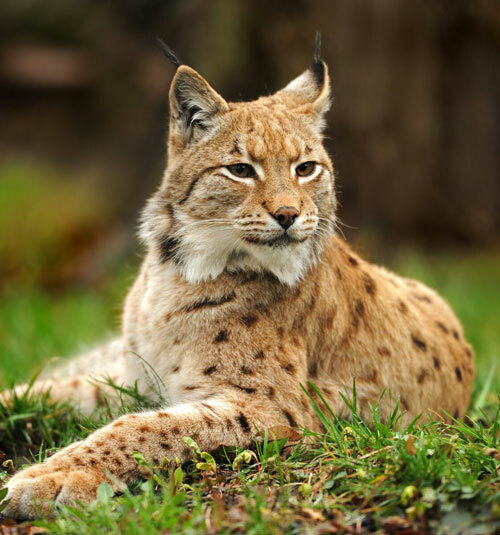 One more interesting tidbit about the lynx (sometimes referred to as the bobcat) is that they are found throughout most of the world, just like our Twonky technology is in use throughout most of the world. The lynx are certainly celebrated in Finland, where it is the official mascot for a prominent hockey league and can be found featured in the emblem of various government entities. Not surprisingly, our engineering team members in Tampere, Finland, were among the most enthusiastic when the lynx name was first suggested in internal discussions. Looking back on the naming process, it was a fun experience. We are proud of our name and pleased that we achieved the naming objectives set at the beginning of the process. We hope you have enjoyed learning the story behind our Lynx name. 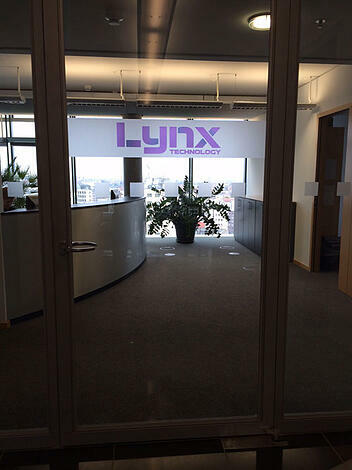 Check out the new front door at our office in Berlin with our new company logo (see above). If you’re in San Diego (to meet with us, perhaps) and have the time, try to stop by to see the lynx at the San Diego Zoo! Or if you get to Finland (meeting with our engineering team, perhaps), keep an eye out for lynx in the wild and lynx signage you might see around town while you are enjoying this beautiful country.